Bengaluru, June 24th , 2017: Videocon, a major consumer electronics and DTH company, along with ASSOCHAM and CEAMA, organized a GST Summit for traders where the implications of the proposed ‘one nation-one tax’ were discussed. The summit also addressed doubts raised by consumer electronics retailers. The Bengaluru chapter of the ASSOCHAM CEAMA GST summit powered by Videocon and Videocon d2h was inaugurated by the Chief Guest Shri. R.V. Deshpande, Honourable Minister for Large and Medium Scale Industries, Department of Commerce and Industries, Government of Karnataka. The seminar was also addressed by Shri. Narayan Swamy, Commissioner - Service Tax, Bengaluru. Bengaluru is one of the 200 cities where Videocon plans to spread awareness and impart knowledge about GST, to consumer electronics trade partners. The national rollout of the ASSOCHAM-Videocon GST Summit in Delhi was welcomed by Shri Arjun Ram Meghwal, Honorable Union Minister of State for Finance, Government of India. He commended ASSOCHAM and Videocon for organizing the summit for the benefit of the trader community. GST Summit received a tremendous response from traders in Bengaluru. Consumer Electronics retailers, utilized the platform to clarify all their GST queries. Videocon Group is a global business conglomerate with a strong presence in Household Consumer Goods, Mobile Handsets, DTH, Retail, Oil & Gas, and the Power sector. Videocon group has constantly leveraged a culture of innovation to develop a range of market re-defining products. Photo Caption- Shri. R.V. 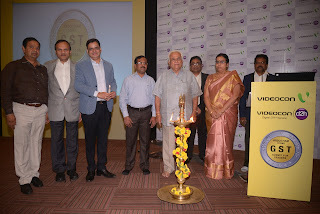 Deshpande, Honourable Minister for Large and Medium Scale Industries, Department of Commerce and Industries, Government of Karnataka rolls out the ASSOCHAM VIDEOCON GST Summit for traders in Bengaluru. Shri. Narayan Swamy, Commissioner - Service Tax, Bengaluru was also present on the occasion. Shri Pradeep Dhoot welcoming Shri. R.V. Deshpande, Honourable Minister for Large and Medium Scale Industries, Department of Commerce and Industries, Government of Karnataka at ASSOCHAM Videocon GST Summit in Bengaluru.